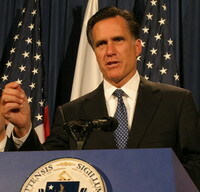 All presidential candidates are trying to deliver their messages, Mitt Romney is among them. He started his supportive speech during the official bus tour this morning in western Iowa . Romney’s wife, Ann, and Michigan Rep. Pete Hoekstra accompanied the candidate. Romney spoke about 10 minutes and took no questions. The former leader in Iowa, Romney talks about his experiences in office and in life, his background in corporate America and public service. "In a number of ways, with the recognition that a lot of humility is necessary at a time like this, I do believe that the unique experiences I've had in my life have prepared me for facing the entirely new generation of challenges we face," Romney told voters Thursday in New Hampshire. He highlighted his support of the scandal-ridden 2002 Winter Olympics in the shadow of the Sept. 11 attacks, his attempts to pass a universal health insurance law in Massachusetts. "There are other people running for president who have health care ideas," Romney said - "Some even have health care plans. I believe I'm the only person running for president - Republican or Democrat - who can point to a health care success." His speech was full of optimism: "I'm convinced that the source of America 's strength is the beliefs and the values of the American people. It's not goverment that makes us strong; it's our people. It's hardworking, God fearing, education loving, opportunity seeking, risk taking, patriotic American people." The bus tour is going to be intense these days, as it’ll take up five days.